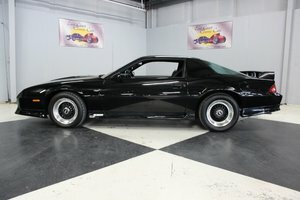 This 2 owner, 1991 Z28 has an RS body and was built for the Colorado State Patrol for police duty. Special suspension package and factory installed roll bar, 350ci fuel injected Corvette engine and limited slip differential. This unit was used by a lieutenant with very few pursuit duties in the Colorado Springs area. Left side under hood autographed by Erik Estrada and shock tower autographed by the Grandfather of the F-Body Camaro, Scott Settlemire.